Red Deer College (RDC) recently installed the largest micro-generation solar power system in Alberta. 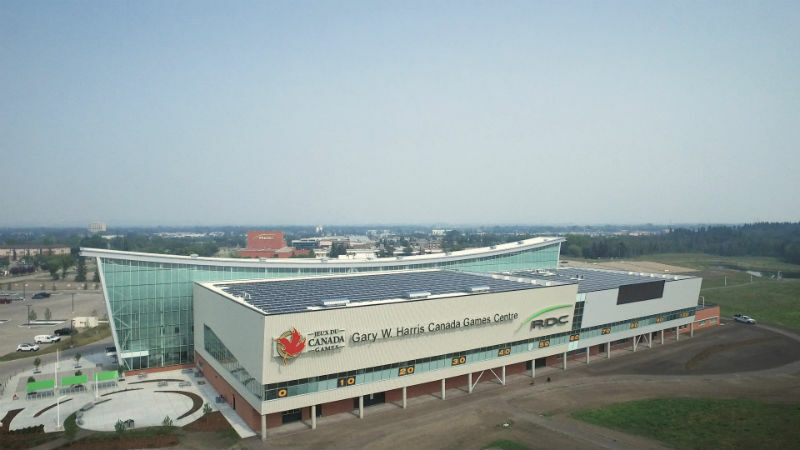 The 3,633 solar modules are spread over four buildings and structures at the Gary W Harris Canada Games Centre, New Alternative Energy Lab, Carpentry Roof, and a new Pedway connecting the Harris Game Centre to the adjacent buildings. The Harris Game Centre is the largest of the system's sub-arrays with 2502 solar panels and over 1,000kW of installed solar capacity over three large roof. Connecting the Harris Game Centre to the adjacent buildings to the east is a custom-built pedway spanning nearly 500' and capped with 276 bifacial solar modules. The bifacial modules have a clear glass backing which allows light to pass through. Two existing buildings for the Carpentry and Automotive wings of RDC received an additional 789 solar panels. Kuby Energy was very proud to complete this project for the General Contractor, Clark Builders, and the system Engineer & Commissioning team, ATCO. Contact us to tell us what you think or to get a free quote. Or click here to read up on solar energy information.